Just what is "Armageddon"? Will it be World War III? Will the armies of the United States and Great Britain be defending Palestine against Russia in that battle? Read in this article the amazing answer. You will probably be astonished! WE HEAR a great deal, nowadays, about "Armageddon." Yet few know what it is! Like most other topics of Biblical prophecy, what is Popularly taught on this subject has been accepted without question by nearly everyone. And, as in most other questions, the people have been turned away from the truth and have unthinkingly embraced fables. When World War I first broke out, many began excitedly to proclaim: This is the Armageddon war!" 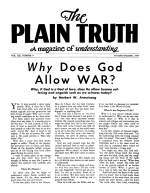 Again, many confidently proclaimed that World War II was the war that would end at Armageddon. A popular conception now is that Armageddon" is the prophesied last battle of a coming war between the democratic Western World and Communist Russia. It will supposedly be a battle between atheistic Communist Russia on the one side, attacking Jerusalem with the British and American armies on the other side, defending it. And at the precise instant of this final colossal battle, the second coining of Christ is to occur. But is this common conception true? The word "Armageddon," strange as it may seem, occurs only once in all the Bible It is found in Revelation 16:16. Let's look at it. Begin with the 13th verse of this chapter: And I saw three unclean spirits like frogs come out of the mouth of the dragon, and out of the mouth of the beast, and out of the mouth of the false prophet. For they are the spirits of demons, working miracles, which go forth unto the kings of the earth and of the whole world, to gather them to the battle of the great day of God Almighty. (Behold, I come as a thief. Blessed is he that watcheth, and keepeth his garments, lest lie walk naked and they see his shame.) And he [another translation is "they" I gathered them together, into a place called in the Hebrew tongue, ARMAGEDDON [marginal reading "Har Magedon"]." First, notice that "Armageddon" is a Hebrew word, not an English word. Actually, the Hebrew word is "Har Magedon" or "Har Megiddo." In the Hebrew, the H's are usually not pronounced, and so are often omitted in the spelling in English. Megiddo is in the Valley of Jezreel, some 70 miles northwest of Jerusalem, just in from the port of Haifa. The Hebrew prefix "Har" means "fortified," or "fortified hill." Between World War I and World War II the British fortified Haifa at a cost of many millions of dollars. Consequently, Megiddo (or Magedon) has now become, in fact, ARMAGEDDON! Secondly, notice the battle in question is actually stirred up, no, by men or nations alone, but by spirits — three spirits — and they are unclean spirits or demon spirits. (The word "devils" in the King James Version ought to be rendered demons.) These spirits INFLUENCE" the leaders of the nations — deceiving them — stirring them to this battle. These unclean spirits come out of the mouths of the DRAGON, the BEAST, and the FALSE PROPHET. What is the Bible definition of these three powers? The DRAGON is interpreted by the Bible as the devil or Satan (Rev. 12:9). The BEAST according to the Bible is the political leader of the Babylonish system, pictured in Daniel 7, Revelation 13 and 17. The BEAST is yet to appear in Europe for a final revival of fascism to head the last rebirth of the Roman Empire — a United States of Europe that will startle this world! The FALSE PROPHET is the religious or ecclesiastical leader who shall, in the near future, be associated in a mutual working agreement with this final restoration of the Roman Empire. The three unclean spirits come out of the mouths of these three — the devil, the "beast" and the "false prophet." In I Kings 22:21-23 we find unclean spirits, lying spirits, in the mouths of the false prophets in ancient Israel. Those spirits so completely deceived the ministers of that day that the demons or lying spirits actually talked through the mouths of the prophets. So the three unclean spirits mentioned in Revelation will possess the beast and the false prophet and use their mouths to utter lies to deceive the nations. And now, thirdly, notice the NAME of the battle to which the spirits cause the armies of the nations to be gathered. This is most important! The text does not speak of any "BATTLE of Armageddon" at all! It is the "BATTLE OF THE GREAT DAY OF GOD ALMIGHTY." "ARMAGEDDON" is the place where the armies gather. But the BATTLE is not called "Armageddon." It is the "BATTLE of the GREAT DAY OF GOD ALMIGHTY." The "Great Day of God Almighty" is, of course, the great "DAY of the LORD" as it is spoken of in so many prophecies in both Old and New Testament Scriptures. And what is the "Day of the Eternal"? "The great day of the Eternal is near that day is a day of WRATH, a day of trouble and distress, a day of waste-ness and desolation, a day of darkness and gloominess, a day of clouds and thick darkness" (Zephaniah 1:14.15). "The day of the Eternal's anger" we read in Zeph. 2:2. Notice that the battle of the Great Day of God Almighty comes as a climax to a time when the whole earth has been rendered waste and desolate by the wholesale destruction of war. "Alas for the day! for the day of the Eternal is at hand, and as a destruction from the Almighty shall it come." The Almighty sends it! It is the Great Day of God Almighty! It is a day of DESTRUCTION — and God sends the destruction! "Behold, the day of the Eternal cometh... For I will gather all nations against Jerusalem to battle; and the city shall be taken, and the houses rifled, and the women ravished; and half of the city shall go forth into captivity, and the residue of the people shall not be cut off from the city. THEN SHALL THE ETERNAL GO FORTH, AND FIGHT AGAINST THOSE NATIONS, as when he fought in the day of battle. And his feet shall stand in that day upon the mount of Olives, which is before Jerusalem on the east (Zechariah 14:l — 4). This is the climactic BATTLE of the Great Day of God Almighty! Is this Great Day of the Eternal, then, the prophesied "Great Tribulation"? No! It follows the Great Tribulation. Notice Joel 2:31: "The sun shall be turned into darkness, and the moon into blood, before the great and terrible DAY OF THE ETERNAL come." The DAY OF THE ETERNAL is the time of the plagues sent from God. It is the time of His WRATH, the time of his supernatural intervening in this wholesale slaughter and destruction by man. But God will not send this PUNISHMENT upon a sinning world until lie has WARNED THEM. First, He will send terrific supernatural SIGNS in the sun, the moon and the stars. There shall be great tidal waves, earthquakes, convulsions of nature that shall throw men — who know not God and these prophecies — into frantic terror, thinking the "WORLD IS COMING TO AN END" (Rev. 6:12-17; Luke 21:25-26). All this follows the Great Tribulation. You will find the final Great Tribulation described in Matthew 24. (Remember, the tribulation during the Dark Ages was merely a forerunner of this AGE-END GREAT TRIBULATION.) Notice verse 29, of Matthew 24: "IMMEDIATELY AFTER the tribulation of those days shall the sun be darkened, and the moon shall not give her light, and the stars shall fall from heaven, and the powers of the heavens shall be shaken." First comes the Tribulation; then supernatural signs; then the Day of the Lord. Notice this same sequence described in Revelation 6:12-17. In this scripture the Day of the Eternal is the Day of God's WRATH. Now notice an amazing fact, revealed by a New Testament prophecy — a fact very few have grasped! It is found in I Thes. 5:1-3. "But of the times and the seasons, brethren" — notice that Paul is writing to the "brethren" — "ye have no need that I write unto you. For yourselves know perfectly that THE DAY OF THE LORD so cometh as a thief in the night." "For when they" — the word "they" refers to the leaders and rulers of the world. Paul is writing to the brethren about the affairs of this present world — "when they shall say PEACE and safety; then sudden DESTRUCTION cometh upon them, as travail upon a woman with child; and they shall not escape. Notice. It shall come suddenly, unexpectedly. It is the time prophesied by Isaiah: "Howl ye: for the DAY OF THE ETERNAL. is at hand; it shall come as a destruction from the Almighty.. Behold the DAY OF THE ETERNAL cometh, cruel both with WRATH and fierce anger, to lay the land desolate: and He shall destroy the sinners thereof out of it... and I will punish the world for their evil" (Isaiah 13:6-11). First, "THEY" — the world rulers — shall proclaim PEACE! and safety! Just before the terrible DAY OF THE LORD. "Peace!" is to be proclaimed. There shall be no real peace, but world rulers shall proclaim it! And then what? And then, as soon as PEACE is proclaimed, then the sudden DESTRUCTION of the plagues of the DAY OF THE ETERNAL shall fall upon them. That is the time of GOD'S wrath. The "Great Tribulation" must come PRIOR to the DAY OF THE LORD. Immediately after the Tribulation, said Jesus, the terrible supernatural signs shall occur — in the sun, the moon, the stars earthquakes, tidal waves, convulsions of nature. These catastrophic occurrences in nature are to occur before the DAY OF THE ETERNAL (Joel 2:31). But what is the "Great Tribulation"? Most people have taken it for granted that the Tribulation is the time of God's wrath — the DAY OF THE ETERNAL. But it is not. It precedes the Day of the Eternal. Jesus' Oliver prophecy explains it. This prophecy reveals the succession of events up to now. The disciples had asked Jesus what would be the sign of His coming, and of the end of the age (Mat. 24:3). And He had replied that first would come false preachers proclaiming a false gospel, yet coming in the name of Christ; then wars culminating in the present series of World Wars and the Cold War — kingdom and nation against one another; third, famines; fourth, pestilence's. These are just beginning to stalk the world. "All these," said Jesus, "are the beginning of Sorrows." Then what next? "Then shall they deliver you up to be afflicted, and shall kill you," Jesus foretold. "And ye shall be hated of all nations for my name's sake" (Mat. 24:9). Notice, Jesus used two pronouns — "THEY" and "YOU." "Then THEY shall deliver YOU up to be afflicted, and shall KILL you." Remember this: In New Testament language the pronoun "YOU," unless otherwise clearly defined, refers either to truly converted CHRISTIANS, or to NATIONAL Israel or Judah, or to both Christians and Judah or Israel. If it is speaking spiritually and individually, the pronoun "YOU" refers to those who are truly begotten children of God. If the context is speaking nationally, it refers to Israel, or Judah, or both. In this particular case, comparison with the account in Mark 13 and Luke 21 makes it evident that Jesus used this pronoun in a DUAL sense, including both Spirit-begotten CHRISTIANS and flesh-born Israelites as nations! The limited national trouble which befell Judah in 70 A.D. was merely the early type and forerunner of the great NATIONAL invasion and captivity YET to occur. This is speaking of WAR — of national invasion and captivity. The CLIMACTIC MAJOR fulfillment of this prophecy is YET to occur, just shortly before the Day of the Eternal's WRATH. This is speaking of the final GREAT Tribulation. It will be a time of WAR and national INVASION and CAPTIVITY of God's nation ISRAEL. Not Judah alone! These prophecies refer not only to Christians, but to the so-called LOST TEN TRIBES OF ISRAEL — the American and British peoples, the democracies of Northwest Europe! If you don't know where the United States and Great Britain are mentioned in prophecy, read immediately for my FREE booklet "The UNITED STATES and the BRITISH COMMONWEALTH in Prophecy." The Great Tribulation is not, as so many erroneously assume, the time of God's wrath. It is the time of Satan's wrath. The Great Tribulation is Satan's last persecution and martyrdom against the true begotten sons of GOD. Notice that the tribulation, the next prophesied major occurrence, is to come when "ye therefore shall see the abomination of desolation spoken of by Daniel the prophet, stand in the holy place" (Mat. 24:15). This is described in Luke's account of this same prophecy as "Jerusalem compassed with armies" which is a sign that the city's desolation is near (Luke 21:20). It is described in Daniel 11 as the armies of the coining fascist revival of the Roman Empire invading Palestine! So, together with the martyrdom of Christians and the invasion of America, the British Isles and the democratic nations of Northwest Europe, there will be an invasion of Palestine and the Near East. This will be the first round of WORLD WAR III! For Satan's fiendish persecution and martyrdom of God's saints, GOD shall take vengeance. God will step in and supernaturally intervene. First, as a WARNING, shall come the terrible SIGNS! — signs in the sun, the moon, the stars — the convulsions of the earth and the heavens (Mat. 24:29). And then shall follow the DAY OF THE LORD! The DAY OF THE ETERNAL will quickly come — the time of God's wrath — the time of the PLAGUES. The "trumpet" plagues and the "Seven last plagues" are God's judgment upon the great ecclesiastical empire ruled by the false prophet. This false system is the power which caused the martyrdom of saints in ages past; this is the power that will line up with the revival of the Roman Empire in Europe and will cause the coming martyrdom! This great ecclesiastical system is pictured as a fallen woman astride the "beast." This woman is called "BABYLON (Rev. 17:5). She is "drunken with the blood of the saints, and with the blood of the martyrs of Jesus" (verse 6). She CAUSES them to be killed by pronouncing sentence (Rev. 13:15). The "beast" which the woman rides is the Roman Empire. All students of prophecy recognize that. Even the Roman Catholic Douay Version gives this in a footnote. The empire was, and is not (verse 6), but shall be brought back into being once again. It shall be accomplished by a UNION of TEN DICTATORS who will be given authority as kings for a very short time. This is explained in verses 12 and 13. These fascist dictators, with their armies, will be under the direction of a great Church-State coalition now being plotted in Europe! Now let's continue. The fascist armies, remember, will have poured into Palestine. When tidings of an impending Russian invasion of Europe frighten the coming United States of Europe, the "beast" — the future fascist dictator in Europe — and the "false prophet" — his religious consort — will rush plans to set up the tabernacle and the palace in Palestine (Dan. 11:41, 45). Their headquarters will be moved there. During their reign, the true Word of God will not he permitted to be preached (Amos 8:11). After the tribulation only God's "two witnesses," inspired with supernatural powers shall be permitted to warn the world of what is then coming. And after three and one-half years, even they shall be killed and their bodies lie unburied three and a half days in the streets of Jerusalem (Rev. 11:3-10). "These" — these newly crowned kings forming the revived Roman Empire — "shall make war with the Lamb, and the Lamb shall overcome them: for He is the Lord of lords, and King of kings" (Rev. 17:14). Christ is the "Lamb." But He does not appear as "Lord of lords, and King of kings" until His SECOND COMING! Jesus shall come at the outpouring of the seven last plagues of the DAY OF THE LORD — the very climax of the great and terrible "day." He shall come at the time when God's final judgments are being poured out upon this fornicating ecclesiastical system. At that time Jesus Christ shall return to RULE! "The kingdoms of this world are become the kingdoms of our Lord and of His Christ; and HE SHALL REIGN FOREVER!" (Rev 11:15) Christ is the STONE, then smiting the entire rotten Gentile political ecclesiastical system on the "TOES" of the "image" (of Daniel 2), and the KINGDOM OF GOD shall rule this earth and finally bring REAL PEACE, and happiness and JOY to a sin-sick, war-weary earth! But the "beast" and the "false prophet" shall FIGHT against Christ! They shall fight desperately to retain their foul system. And the BATTLE that ensues in this struggle to see whether MAN or GOD shall rule the earth for the next THOUSAND YEARS is the BATTLE OF THE GREAT DAY OF GOD ALMIGHTY — often misnamed "Armageddon." The armies which gather at "Armageddon" proceed to battle and fight Christ in the environs of Jerusalem. Who shall fight whom? Will Russia and China and their communist allies fight against the British and American armies in this battle? No! Nowhere is one word said in prophecy to give such an idea. "And I saw the beast [the coming fascist dictator in Europe] and the kings of the earth [his allies], and their armies, gathered together to make war against" — AGAINST WHOM? Not Britain and America! NOT Israel! — for they have already been conquered by this revival of a fascist Roman Empire. But against HIM THAT SAT ON THE HORSE [Christ] and his army" (Rev. 19:19). And who composes His army? Note verse 14: "And the armies which were in HEAVEN followed Him upon white horses." Shall the British and American armies go up to heaven? No! Our people, young and old, are in slavery and await the return of Christ to DELIVER them. Then who compose these armies? Just one Scripture tells: "When the Son of man shall come in His glory, and all the holy angels with Him..." (Mat. 25:31). The HOLY ANGLES from heaven are Christ's army! A SPIRITUAL host is coming to take over! It is CHRIST and the ANGLES that fight the willful rebellion of mortal men. THAT is the "BATTLE of the Great Day of God Almighty!" That is the battle popularly misnamed "Armageddon"! It shall mark the turning point in history — the beginning of PEACE — real PEACE on earth, and good will toward men!